Car rental company Avis has announced its intent to scoop up car-sharing company Zipcar for $500 million, with the acquisition expected to close in the Spring of 2013, according to a press release. 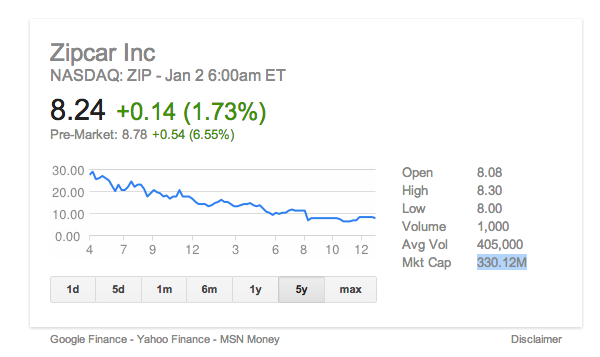 Zipcar itself went public in April 2011. “By combining with Zipcar, we will significantly increase our growth potential, both in the United States and internationally, and will position our company to better serve a greater variety of consumer and commercial transportation needs,” said Avis CEO Ronald L. Nelson in the announcement. ZipCar began the morning of its IPO trading at $18 a share, and its stock eventually popped to $27.96 that day, a rise of over 50 percent. By the end of trading it was a billion-dollar company, at more than 2x the value of what it was acquired for today. Since its IPO, the recently profitable company — which has more than 760,000 members in 20 different cities and over 300 college campuses in the United States, the UK, and Canada — has seen less-than-stellar stock performance. Over the past two years it’s lost almost two-thirds of its post-IPO value, and today’s acquisition is at a 49 percent premium over its closing price on December 31, 2012. After the acquisition closes in the spring, the Zipcar team will continue its planned move to Boston, and Avis expects that Zipcar CEO Scott Griffith and COO Mark Norman will stay on to run the new Avis/Zipcar subsidiary. Avis expects that the merger will generate $50 million to $70 million in annual savings, including the expensive process of maintaining and financing Zipcar’s fleet. Before its IPO, Zipcar had accumulated $60.7 million in funding from Revolution Living, Globespan Capital, Benchmark Capital Partners, Greylock Partners, and Smedvig Capital, and it raised $174 million in its public offering.